CONTENT WARNING for discussion of homophobia and suicide. SPOILERS for all of of Revue Starlight. Fittingly for a series so inspired by theatre, Revue Starlight has quite a spectacular finale. Across its twelve-episode run, the musical, magical, swashbuckling school story explores themes of competition and rivalry, unfair systems, and love and friendship. It brings these all together in an ending that packs a wonderfully metatextual and rebellious punch, with its main characters Karen and Hikari (and the relationship between them) taking the lead. When they were young, Karen and Hikari watched a stage performance called Starlight that inspired them to get into show business themselves. Now attending theatre school, the two girls find themselves auditioning for roles in a new production of Starlight. The play is a constant backdrop across the series, not just as a story-within-a-story that’s important to the characters, but as a framing device that draws attention to the themes of the show. As the series progresses, it becomes increasingly clear that the narrative of Starlight parallels the story of Karen and Hikari themselves—something that does not bode well for them, given that Starlight ends tragically for its two female leads. But the climax of the series sees Karen acknowledging and outright rejecting this expectation. She rescues Hikari from where she’s been trapped in the magical, underground theatre, saving her from an unhappy fate. Once the two return to the surface world, they defy the tragic tradition of Starlight, rewriting the ending of the play not just metaphorically but literally, so that its leads can live happily ever after instead of being torn apart. Through escaping from the theatre Underworld and rewriting the tragic ending of the in-universe stage play Starlight, the protagonists of Revue Starlight break a cycle of tragedy. In doing so, their actions serve as a commentary on—and rejection of—the “Bury Your Gays” trope and the historical convention of sad endings for queer characters. The Starlight play tells the story of two goddesses, Claire and Flora. They become close companions when they meet at a festival, and later must travel to retrieve a star when Claire loses all memory of Flora. Once the magical star is within reach, however, the story takes a dark turn: Claire’s memory and affection returns to her, just in time to see Flora get blinded by the starlight and plummet from the tower they had climbed together. Claire is trapped in the tower, and Flora falls back to earth, the two doomed to never see each other again. Karen and Hikari’s story mirrors their beloved Starlight: their relationship becomes fractured after years apart, and just as it seems the two of them are back on good terms and poised for a happy ending, circumstances tear them apart. Having just reiterated their childhood promise to become stars together, the cruel audition system pits Hikari and Karen against each other in the underground theatre. In the end, Hikari is left standing in the “tower” with the “star” (or at least, the Top Star position), and Karen falls. In the next episode, Hikari has disappeared from school. Like the goddesses before them, the two are separated in a moment of heartbreaking dramatic irony. And so their personal narrative matches up thematically with that of Starlight… or at least, that would be the case if the story had ended there. But Karen refuses to have their tale end in sadness and separation, and so she journeys back to the mysterious underground theatre. Karen rescues Hikari from where she’s been trapped in a surreal personal prison, and the two return successfully to the outside world. There, their class performs in a revised version of Starlight—this time with a happy ending where the goddesses get to stay together. 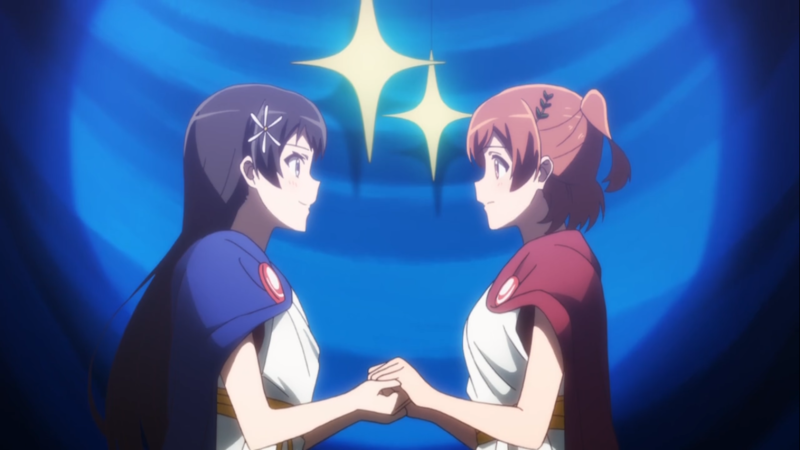 While Revue Starlight lacks the usual Hollywood signifiers like declarations of “I love you” or climactic on-screen kisses, the relationships between girls in the show are still heavily romantically coded. The same can be said of the lead characters in Starlight. By travelling Orpheus and Eurydice-style to rescue her beloved Hikari from eternal doom, Karen breaks the pattern established for them by the parallel story of Starlight. Their new version will not be a tragic love story between two women, but one where they can end up happily together. It makes for a satisfying ending to their arc and the series overall, but it also serves as a clever metatextual commentary on storytelling and tragedy—namely, the tradition of queer tragedy. Revue Starlight spends most of its run critiquing various elements of the Takarazuka Revue, the famous all-female theatre troupe from which the show draws a lot of inspiration. Most clearly, Karen’s passionate decree that “we will all do Starlight!” is in defiance of the Takarazuka’s Top Star system, where there can only be one woman in the leading role (with all the stardom and prestige that comes with that). Tragic endings, too, are part of the Takarazuka tradition—to the point where the love interest in one of their most popular shows is Death personified. You can generally expect a “rondo of love and death” when attending a Takarazuka performance. This also carries over into the world of Revue Starlight, with the play Starlight fitting into this trend of romantic tragedy with its unhappy ending and two female leads. So it’s only natural that, as Karen’s final and most brazen act of defiance against tradition, she rewrites the ending of Starlight and makes it a happy one instead. In Karen’s version, she and Hikari can share the stage, and the lead characters of that story can live happily together instead of being tragically separated—a double-whammy of deviation from the Takarazuka norm. This literal and metaphorical rewriting of the expected script is part of Revue Starlight’s ongoing critique of the Takarazuka, but it also addresses and rejects a broader trend in fiction. By now most people who move in fandom and/or media studies spaces will be familiar with the term “Bury Your Gays,” referring to a general trend of queer characters dying in fiction. In western media, this trope has deep pop cultural roots. The middle of the twentieth century saw a gay pulp fiction boom in America, but an unhappy ending was often a prerequisite for getting these stories published lest they be seen as encouraging “deviant” behavior. Sometimes this meant the book’s couple splitting up, with one or both of them renouncing their queerness and ending up in straight relationships; sometimes one or both would go insane; and, most commonly, one or both would end up dead. Since Starlight is, in-universe, based on an English novel, we can reasonably assume it came from this sort of media climate. Adapted as a Takarazuka-style stage show, it’s guaranteed a tragic ending twice over. Though we’re living in a much freer media climate than when these novels and films were first published, the unhappy tropes they established and normalised have hung on and can still be seen in contemporary fiction. This study of fandom reactions to a lesbian character’s death shows that not only are these tropes still present, but audiences are both aware and weary of them. There’s a place for tragedy and melancholy in fiction, of course, and stories of queer tragedies are important to many readers because they accurately reflect the hardships marginalized groups have gone through and still go through today. However, across demographics, genres, and mediums, audiences are increasingly demanding a shift away from this archetype and calling instead for happy stories that LGBTQIA+ audiences can see themselves in. There comes a point where you, personally and collectively, just get sick of seeing people like you die in every story where they appear. There comes a point where you want something different and positive, whether that means telling new stories with your own voice or reclaiming and reworking those “old, bulky, and depressing” tales from the past. Awareness of this trope and this fandom climate is what makes the finale of Revue Starlight so important and so moving. When Karen drops from the platform after her duel with Hikari, it seems as though the girls are doomed to fall (literally) into the tragic pattern that Starlight and a long history of narratives laid out for them. To further the point, Hikari’s torment involves reciting lines from Starlight endlessly. This strips the glamour from the play that both girls had admired so much, and reveals it instead to be part of a harmful, perpetuating system. Karen interrupting Hikari’s endless recital means interrupting and upsetting that system—breaking it apart and making something new in its place. This finale rejects the convention of queer tragedy on two levels. Firstly, Karen essentially retrieves Hikari from the Underworld, rescuing her from her status as a (metaphorical) Buried Gay. This imagery of bringing her “back to life” is enhanced by a repeated use of the I AM REBORN lettering that has headed Karen’s transformation sequences throughout the series. In the finale, the words gain new meaning: Karen refuses to die (symbolically or otherwise) within the constraints of Starlight’s story and the brutal audition system. She refuses to let Hikari die either, even if she has to fight her way through a metaphorical Hell to do it. Secondly, once back in the world above, the girls perform an adapted Starlight with a happy ending. In this new version, the goddesses escape from their adventure with their lives and memories intact, hand in hand. Naturally, the goddesses are played by Karen and Hikari, proving once and for all that they’ve made these roles their own and given them their own meaning. They’ve taken control of their own narrative. With both girls on center stage, they reject the Top Star system that pitted them against each other, but they also reject the narrative conventions that have been threatening them since their story interlinked with that of Starlight. They’re alive, and they’re together, and they’re happy—screw tradition. This finale provides both an in-story and metatextual rejection of the tragic queer ending. You could say that, literally, the pen and the sword are equally powerful here: Karen and Hikari’s dramatic escape from the Underworld and the rewritten Starlight are both treated like rebellions and triumphs in their own different, but important, ways. It’s rewarding to see a story deal so directly and so defiantly with these harmful tropes and these historical traditions. The final message of the series is essentially that, while it may take effort and hardship, we should absolutely fight for change and for happy endings, in fiction and in the structures that influence fiction. We can buck tradition to make a space for our stories in the mediums that we love, and we can each be the star of our own happy Starlight. Alex Henderson is a writer and fledgling academic, currently working on a creative thesis about mythic archetypes and gender. She has reviewed books for magazines, been published in fiction anthologies, and applies her analytical brain to anime, superheroes, pop culture, and other fun things over on her blog The Afictionado. You can also find her attempting to be terribly witty on Twitter.